erty, and also has been one of the leaders in public affairs of his vicinity since the first years of his residence here. Mr. Ewing is native of Perry county, Indiana, born November 17, 1831, and a son of William G. and Mary Ewing. His childhood was spent in that vicinity and when about twenty-one he went to Henderson county, Illinois, and engaged in farming. During the month of August, 1862, Mr. Ewing enlisted in Company K, eighty-fourth Illinois Infantry, and served with his regiment up to the close of the war, taking part in many of the principal battles, among them that of Perryville and Wild Cat Mountain, Kentucky Chickamaugua, Tunnel Hill, Resaca, Pine Mountain and Kenesaw Mountain in Georgia, also many minor skirmishes and encounters. He received his honorable discharge on June 7 1865, returning at that time to his home in Illinois. In the spring of 1867 he went to Iowa, locating near Red Oak, where he engaged in farming for several years and then moved to Red Oak. He then went into the grain business at Coburg, but continued to reside at Red Oak. He had a large trade in the grain business for a number of years. Mr. Ewing came to Genoa, Nebraska, in 1882, establishing a banking and real estate business in which he was engaged for about one year, then purchased four hundred acres of land a shorrt distance from the town and started a grain and stock farm. In 1883 he was elected assessor for Nance county, and served in that capacity for seventeen years, also was justice of the Peace for a time. While in Iowa he held the office of county commissioner for two terms, or six years. In 1904 Mr. Ewing sold his various business interests and retired from active work. Both himself and wife have been through all the early history of Nebraska, and are widely and favorably known in every movement started for the benefit of their locality. Both have taken a prominent part in church work for over thirty years, and Mr. Ewing has been for a great number of years an official in the Presbyterian church in Genoa. In March, 1857, Mr. Ewing married Eliza A. Short, a native of Illniois. Miss Short was the eldest in a family of eight children, five of whom are still living although the parents are both deceased. Mr. Ewing's parents are also dead, and of nine children in the family five are still living, scattered in different parts of the country. Mr. and Mrs. Ewing have had two children, Emma A., now deceased, and Lizzie A., wife of W. E. Kennedy, living in Genoa, parents of two daughters. Our subject and his good wife have a pleasant home in Genoa, and are passing the evening of their lives in a peaceful and happy manner, surrounded by many friends who enjoy their hospitality on various occasions. Horace L. Brooks, a true and tried citizen of Boone county and a man of large business interests, died February 8, 1911, at his home in Albion. Mr. Brooks was widely known as a man whom one could trust-upright in his dealings; he was a ready, willing neighbor - pleasant and congenial; as a citizen, his character is an example for the rising generation of Boone county. His portrait appears on another page. Mr. Brooks was born in Springville, New York state, September 13, 1852, and was the eldest child of Alonzo and Mary Jane Brooks who were the parents of three. When but an infant he went to Washington, D. C. with his parents, and remained until he was two years of age, then the family came to Boone county, Illinois and there he spent his early boyhood, receiving his education in the local schools and later attending the Illinois State Normal. He taught school when a very young man both in Illinois and later in Mills county, Iowa, coming to Nebraska in 1873, joining his father who had settled in Boone county about a year previously. He homesteaded soon after striking the locality, then returned to Iowa and resumed teaching for a year. He was married in Iowa in February 1874, to Agnes J. Van Orsdel, at the home of her parents, in Mills county. In the latter part of March, Mr. and Mrs. Brooks removed to their homestead in Boone county, Nebraska, built a sod shanty, and begun a pioneer existence at farming and stock raising. They passed through all the early experiences here, remaining on the farm up to 1891, then settled in a pleasant residence in Albion. He worked for the News as local editor with part of the time in the postoffice for two years. He afterwards associated himself with Needham & Doten in the real estate business. In 1902 he took the management of the Albion Gas Company for one year. In 1898 he was elected secretary of the County Fair association and he was re-elected every year since that time until his death. It was through his wise and careful management that the fair has prospered beyond any other in the state and has grown to be almost an exposition. Mr. Brooks was a sincere believer in the teachings of the lowly Nazarene and was connected with religious work for many years. When at St. Edward he was identified with the Baptist church, and after moving to Albion he went in with the Congregationalists. For several years he was superintendent of the Sunday school. his mind away from the things of this world to those things that endure. He talked cheerfully and hopefully of the home just across the river. He never complained, but waited patiently for the Father's release from the flesh. If there was nothing more to religion than to die as he died, it would be worth all the self-denial through life that it demands. Four children were born to Mr. and Mrs. Brooks, three of whom are living, as follows: Lulu E., wife of Fred E. Mansfield, mother of one child, they living in Albion; Osborn Alonzo Brooks, married, and father of four children, residing in Sioux City, Iowa, and Daphne May, wife of Archibald Campbell, having one child, their home being in South Carolina. Chance plays queer pranks in the lives of some of us! Opportunity comes knocking at our doors, and sometimes finds the inmate fully equipped and ready to seize what she holds in her open hands. Such is the career of R. H. Harris, cashier of the Bank of Lynch. A chance word of a friendly bank president, who had for years known of the ability and integrity of the younger man diverted from the ranks of trade to that of finance a worthy candidate for a successful career in most any walk in life he might have chosen. "Bert" Harris, as he is familiarly known, is a native of the Knickerbocker state, born at Rochester, on March 26, 1874, and is a son of Frank H. and Mary (Malcolm) Harris, the former having engaged in the grain and lumber business at Onarga, Iroquois county, Illinois, in 1878; four years later removing to Sterling, Johnson county, Nebraska. Here the mother died in July, 1888, and the family soon became somewhat scattered, Bert finding a home with an uncle, J. E. Helm, a druggist at Burchard, Nebraska. In 1890 the uncle was appointed agent to the Indians on the Santee reservation east of Niobrara. While living here our subject was appointed industrial teacher, filling the position some fifteen months. 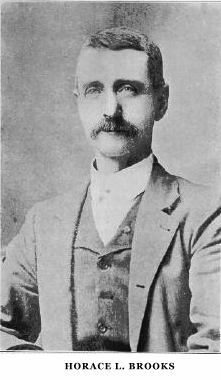 He then attended the Yankton college for two winters, and on leaving school secured a situation in the store of Mr. Henry E. Bonesteel, remaining there until the fall of 1895, when he was elected clerk of the district court of Knox county, Nebraska, holding that position up to January, 1900. Through commercial friends gained while in the Bonesteel store, he was offered a position with a new shoe firm operating from Sioux City, and although he had no experience in that line and could give no assurance of how much trade he could command, he made a good impression and was started out on the road. He ''made good" from the beginning having a genial disposition and hustling qualities which made him rnany friends and stood him in good stead. His long acquaintance with Mr Frank Nelson, of the Niobrara Bank, changed the whole current of his life. That gentleman was desirous of widening his financial interests and was casting about for a trustworthy man of sufficient ability to run a branch bank. He approached Mr. Harris with the question, "How would you like banking ?" The latter replied that ''he might like it but didn't know a thing about it." He immediately forgot the incident, but Mr. Nelson evidently did not, for after a few days a telegram was handed Mr. Harris at O'Neill, which contained the message, "Have bought bank at Lynch. Come at once." An unjustly complaining letter from his firm had reached Mr. Harris just about this time, so he quickly decided to accept the new offer, checked his trunks to Sioux City walked in the office and handed over his keys. This was entirely unexpected to his employers, as it later developed that his sales were the highest of any man on the road, and a request that he remain until after carnival week and meet their country trade was complied with. For this favor his firm presented him with a check for $150 and cash to a third of that amount, and the good wishes of all in his new undertaking. On October 10, 1900, Mr. Harris took charge of the bank at Lynch as cashier, and its president has had no cause to regret his judgment in the selection of a young man to manage this branch of his extensive financial interests. Mr. Harris was married on June 12, 1904, at Fairfax, South Dakota, to Miss Lois Allen, who was born at Spirit Lake, Iowa, her parents now residing in Randolph, Nebraska, where the father is in business. Mr. and Mrs. Harris have one son, Robert Allen Harris, who is the pride and comfort of his parents' hearts. Mr. Harris is a republican in political faith. He has a very pleasant memory of an incident occurring while he was a member of his uncle's household. Theodore Roosevelt, then a special commissioner of the interior department, came to Santee to inspect the post, and as hotel accommodations were not very desirable, he was invited to make himself comfortable at the agent's house, sharing our subject's room with him. The two young men took a three days' hunting trip together, and neither has forgotten the pleasures of the trip. Mr. Harris is a member of the Masonic order, belonging to the Blue Lodge at Niobrara, and has attained the thirty-second degree in the consistory at Omaha, crossing the hot desert sands in Tangier Temple of the Mystic Shrine. The Odd Fellows and Royal Highlanders of Niobrara claim him as a comrade, also the Pythian Knights of Creighton, and the Norfolk Herd of Elks. Samuel W. Pierce, a venerable resident of Albion, is justly proud of the fact that he is one of the earliest settlers in Boone county. Our subject is a native of Plattsburg, New York, born December 16, 1822, and made that state his home for many years. He followed farming during his young manhood, and became prosperous and successful in his home vicinity. He was married on October 30, 1851, to Miss Cemantha Pierce, of Calumet, Illinois, and the following year they located in Wisconsin, remaining there for about fifteen years, then went into Minnesota. Mr. Pierce came to Nebraska in 1878. He purchased one hundred and sixty acres on section seventeen, township twenty, range six, of Boone county, although he never lived on the place. Upon coming to Nebraska, Mr. Pierce located at Albion, where he built a store building, renting the lower part and ran a boarding house above. He continued to reside here until March 4, 1881, when the building burned, after which he purchased eighty acres one mile west of Albion and moved to that place, where he farmed until 1892. In 1892 he disposed of his Boone county property and with his wife moved to Louisiana, where he ran a rooming and boarding house at Lake Charles until 1902, when they returned to Boone county and made their home with their son, Frank J.
Mrs. Pierce died in Albion, on December 6, 1908, at the age of seventy-nine years. She was survived by her husband and five children, named as follows: Judson, married, the father of four children, resides in Albion, as also does Frank Pierce, with his wife; Almond, with his wife and two children, lives in Louisiana, as do Elmer and Ira and their families. The family is one of the best known in Boone county, and enjoys the esteem of all who know them. W. H. Fisher is one of those agriculturists of Wayne county who have made all the improvements on their farms themselves, and to whom the present commercial and agricultural prosperity of the region is due. Their work has made possible the change from an undeveloped, sparsely settled condition to a land of well tilled fields and pleasant and comfortable farm houses. Mr. Fisher was born in Pennsylvania, March 12, 1854, a son of John and Margaret Fisher, both natives of the Keystone state, and the parents of nine children. The Fisher family moved to Bureau county, Illinois, when W. H. Fisher was a year old. He was educated in Bureau county, and reared to farm life, which has been his choice in later years. He left Illinois in 1884 and spent three years in Iowa, whence he drove through to Wayne county in 1887. He then purchased his present home on section twenty, township twenty-six, range two, east, of H. J. Carpenter, and immediately set to work to make improvements on the place. This was raw land when he bought it, and he has built all the buildings and broken all the land. Mr. Fisher is a farmer of intelligence and has enthusiasm for his work, and has brought his land to a high state of cultivation and productiveness He is engaged in mixed farming and raises considerable stock. He has a beautiful grove and orchard, which add to the beauty and value of his farm, and has done his best to make his home a place of comfort and attractiveness. He has been able to add improved machinery, which greatly lessens the work of operating the farm, and is interested in modern methods and ideas of scientific farming. He is one of the substantial and influential citizens who further the plans for public improvement and advancement and has many warm friends in his community. Mr. Fisher was united in marriage in 1884, to Miss Anna Wookey, of English descent, and they are parents of five children. Mrs. Fisher was born in England and is a daughter of Adrian and Jane Wookey, natives of England. She came to America with her parents when a girl. The Wookey family located in Iowa, where the father and mother now reside. Mr. and Mrs. Fisher's children are Purl, Elmer, Lettie, Artie and Vallie. The gentleman above named was for many years one of the leading citizens of Columbus, Nebraska, and to his efforts are due much of the prosperity of that locality. He was a man of strong character, and during his lifetime enjoyed the esteem and respect of all with whom he came in contact, and his memory is cherished by a host of warm friends throughout the country. Moses Kennedy Turner was born in Cadiz, Ohio, June 23, 1838. His parents, Allen C. and Margaret (Kennedy) Turner, are both deceased, his father's death occurring in the year 1891, and that of his mother in 1871. Our subject was the eldest of eleven children, and received his education at Athens, and Yellow Springs college, at Xenia; Ohio. Yellow Springs college was presided over by Horace Mann, a prominent educator and author of his time. Afterward our subject became principal of the Cadiz school and held that position for a number of years; and subsequently served as superintendent of schools at West Liberty, Ohio, for a term of two years. May 13, 1864, he enlisted at Bellaire, Ohio, in Company K, one hundred and seventieth regiment, Ohio National Guards, and was discharged on September 10, 1864, at Camp Chase, Ohio. Mr. Turner participated in one battle in Virginia. After the war he returned to Cadiz, Ohio, and resumed his profession of teaching. received a part of her education in Doctor Beattie's female seminary, in Stubenville, Ohio. Mr. and Mrs. Turner were blessed with a family of ten children, whose names are as follows: Anna Craig, married to Howard Rowe, has one daughter and lives in Omaha, Nebraska; Martha M., on the staff of the "Lincoln State Journal," in Lincoln, Nebraska; Catherine, who died in infancy, in 1871; Alice, who died in 1898, at the age of twenty-four years; Frances, who lives at home; Johnson Craig, who is married and lives in Platte county, Nebraska; Ralph Emerson, who is associate editor of the "Practical Engineer," in Chicago, Illinois; Eliza Kennedy, a teacher in the Lincoln city schools, Lincoln, Nebraska; Irena, a teacher in the Columbus city schools; and Gladys, who has completed a course in the State Orthopedic hospital in Lincoln, Nebraska. In March, 1870, Mr. Turner came to Nebraska, locating in Columbus, where he started the "Platte County Journal," later its name being changed to the "Columbus Journal." The "Platte County Journal," was one of the first papers to be established in Nebraska west of Omaha. Mr. Turner continued to edit the "Journal" until the time of his death, which occurred on May 22, 1902, at his home in Columbus. Mr. Turner was a man of sterling worth, exerting his efforts along the line of advancement. While he lived in Ohio, in the earlier days, he studied law in his father's law office and was admitted to the state bar in 1869. He served Nebraska in its state senate in the years 1880 and 1881, and he also was a member of his city school board for some years. Our subject was prosperous and successful, and owned three hundred and sixty acres of land in Platte county, Nebraska, at his death. He was a man who was alive to all the best interests of his county and state, and a progressive man of affairs. In politics he was a republican, but in 1884 he became an independent candidate for congress, his opponent being W. K. Valentine, and received a very flattering vote. Mrs. Moses Kennedy Turner, wife of the deceased, still lives in the old home in Columbus, surrounded by a large circle of friends, whose esteem and friendship she holds. J. A. Hutto, who has spent many years of his career in the eastern part of Nebraska, is one of the leading citizens of that section of the country. He came here some twenty-six years ago, has watched its growth and development, incidentally assisted in a large measure to build up the region, and he has really improved two different places since coming here. He now resides in section eight, township twenty-six, range five, where he owns a splendid farm of four hundred and eighty acres, and has ten acres of fine trees. Mr. Hutto was born in the state of Indiana, that event taking place in 1860, in a farm house, and his associations from the first being with agricultural interests, it is natural, therefore, that he should be a farmer, and that he should find success in life endeavors in tilling of the soil. Mr. Hutto's father, John Wesley Hutto, was born in 1830, and was of German descent, and died in 1864, in the hospital at Fort Monroe, of a fever, and was buried there. He served in the army during the civil war. The mother, who before her marriage was Miss Clarissa Fish, was also a native of Indiana, born in 1833 and died in 1907. Mr. Hutto remained in his native state until reaching his manhood, then went to the state of Iowa, where he lived three years; in 1884 he started for the west, traveling in the usual pioneer fashion of a covered wagon, and landed in York county, Nebraska, where he remained four months; later, came to Antelope county, where he took up a homestead in section eighteen, township twenty-seven, range five, Crawford township, building a sod house and residing there two years, then built a frame house which burned after he had lived about three years in it. He then built another frame house and he lived there about thirteen years, then sold, and bought his present home. Mr. Hutto was united in marriage in 1884, to Miss Elizabeth Durand, and Mr. and Mrs. Hutto are the parents of six children: Loron, who is married to Gladys Benedict, they having two children; May, who is married to Franklin La Borde; Lily, Walter, Lois and Marcia. Mr. Hutto now owns four hundred and eighty acres of good land, ten acres of which is set to trees, and he and Mrs. Hutto and family live in their comfortable home surrounded by a host of friends and acquaintances. Richard Rehfeld, residing on section thirty-four, township twenty-seven, range four, Pierce county, Nebraska, was born in the Province of Pommerania, Germany, July 25, 1871, eldest in a family of five. When but a child of some two years he was brought to America by his parents, Herman and Johanna (Erdmann) Rehfeld, who after landing, settled in Iowa in 1873, where they lived one summer, thence moving to Nebraska, driving, with six other families, by team, the entire distance, where they rented a farm near Scribner. In 1879 our subject's parents took up a homestead in Pierce county, Nebraska, where the family suffered the bereavement of the father in November, 1880. Mr. Rehfeld's father was born in Germany in 1847, and the mother in 1846, their marriage being solemnized in Germany. She was married a second time to Frank Rehfeld, her first husband's brother, and two children were born to them. She died in February, 1900.
claim, the land where Richard Rehfeld now resides, in the southwest quarter of section thirty-four, township twenty-seven, range four, and in the early days experienced many hardships. During the blizzard of 1888, our subject, a younger brother and others, were kept prisoners by the storm in the school house all night, being saved from freezing by the teacher who had the foresight to get in enough coal to last all night. Our subject's father lost some of his early crops by hail. The father burned hay for several years, and the father hauled wood from Verdegris creek, twenty miles away, occasionally. On one occasion our subject fought prairie fire from nine o'clock in the morning until four in the afternoon, without breakfast or dinner. Mr. Rehfeld was married in 1895 to Miss Martha Zeigfeld, daughter of Herman Zeigfeld, who was born in 1850, in the Province of Pommerania, Germany, and Mary (Vosberg) Zeigfeld, born in 1850, also a native of Germany. Our subject and wife have one child, whose name is Herman. Mr. Rehfeld is a member of the German Lutheran church, and in politics he votes the democratic ticket in the state elections, but in local politics votes for the best man. Lars P. Christensen and his family are among the well known and highly esteemed citizens of St. Paul, Nebraska, where they occupy a handsome residence. Mr. Christensen has large farming interests besides considerable town property to look after, and at the present time he represents the Marshall Brothers Nursery, located at Arlington, Nebraska. Both himself and his estimable wife have passed through all the varied experiences of pioneer life in the state, and after years of toil have acquired a competence. Our subject has taken an active part in the development of Howard county, always standing for the best interests of the county and state. Mr. Christensen was born in Denmark in February, 1842, and made that country his home up to his twenty-ninth year, then came to America. He located at first near Madison, Wisconsin, where he worked on a farm for about seven months, going from there to Chicago. There he was married in November, 1873, to Anna K. Christensen, also a native of Denmark, who came to America to marry her sweetheart. The young couple decided to make a home for themselves in the new west, but as they had little money, both obtained employment on a farm in Illinois, remaining about one year, then came to Nebraska, where Mr. Christensen had a brother living. Instead of the comfortable mode of traveling of the present day, our subject and his young wife started out in a wagon, driving through the country over unbroken roads. They had a, tedious trip of five weeks before reaching their destination, encountering many obstacles and suffering much discomfort from storms, sickness, Indian scares, etc. They crossed the Missoun river on the ice which was not frozen hard and at times their horses broke through, also the wagon wheels cut through and they had considerable trouble in landing safely. They arrived in Omaha on the 29th of December, 1874, and unable to secure hotel accommodations, being compelled to sleep all night in a straw stack, they pushed right on to their destination, remaining with Niels Christensen for two and a half years. The latter had homesteaded for himself and also taken a timber claim for our subject, situated on section twenty-two, township thirteen, range twelve. In 1877 Lars purchased eighty acres on section fourteen, built an adobe house, and they made that place their home for five years, at which time their house was destroyed by fire, they losing all of their clothing, books, furniture, etc. Soon afterwards Mr. Christensen rented his farm and moved to St. Paul. He put up a building and started a hotel, but only ran it for several months, when on account of failing health he was obliged to dispose of it, and purchased a home. He next went into the implement business and after running it a few months, again sold out and built a large livery barn, which he ran successfully for over twenty years. During the same time he was connected with a general merchandise establishment but on account of poor health was obliged to give up active work, and with his wife went to California and spent seven months, returning to St. Paul fully recovered. Mr. Christensen is a staunch republican, and during the years 1897-98-99 served his county as deputy sheriff, the following year was elected constable and held the office for two years. He also was active in the establishment of the school near his farm, being director of that district for a number of years. Our subject has no children, but he and his good wife have reared and educated two boys, brothers, James P. Petersen, who assists Mr. Christensen in business, and Chris Christensen, (the latter taking his adopted parents' name) who is now serving in the United States navy, at present in Japan. On May 19, 1910, Mr. Christensen suffered the loss of his wife, whose death occurred after only a few days illness. John C. Meese, residing in section twelve, township nineteen, range fourteen, who came to Nebraska in 1886, is well known all over Valley county as a progressive and successful agriculturist. (Bailey) Meese, who had six sons. Mr. Meese grew up on the farm, receiving the usual school advantages, and in the fall of 1886, the Meese family of father, mother and six sons came to Wheeling county, Nebraska. The father and sons homesteaded land in Wheeling county, where the parents and sons, William, Thaddieus, Harley, and Roy, still reside; Charles Meese lives in Topeka, Kansas. John C. Meese, the principal subject of this sketch, came to Valley county from Wheeler county in the spring of 1891, locating in Ord, and engaged in the horse breeding business. In 1893 he purchased a farm in the western part of the county and moved from Ord to the farm in the fall of 1894; and lived on this farm in section seven, Geranium township, until spring of 1908, when he moved to a farm in section twelve, township nineteen, range fourteen, where he now has a fine stock farm, and is engaged in the breeding of fine hogs, principally the Poland China breed. Mr. Meese is widely known as a successful breeder, taking many prizes at Nebraska state fairs. In 1909 he won thirteen big prizes at the state fair and two out of four sweepstakes, and again in 1910 secured fifteen prizes and again two out of four sweepstakes. At the Topeka fair he secured fifteen prizes and two sweepstakes-all that were offered. Mr. Meese has received in past years big prizes for his swine, a half interest in single hogs selling as high as $500. He also has high grade horses and good cattle. He lately purchased a fine stock farm six miles south of Topeka, and contemplates moving to that state. Mr. Meese is a successful man, and has done his part toward bringing Valley county into prominence as a prosperous and successful county. Mr. Meese was married to Miss Minnie Waldmann in Ord, February 13, 1893. Miss Waldmann was born in Minnesota, and the family came to Valley county in the early years. Mr. and Mrs. Meese have six children: Bertha, John, Frank, Adrian, Hilda and Rosa Lee, all of whom reside under the parental roof. Mr. and Mrs. Meese and family are well known, have a modern, confortable home, and are an enjoyable family. Mr. Meese has in past years served on the Valley county board of supervisors. He is a member of the Catholic church in Ord, of the Modern Woodmen of America, and is republican in politics. Located very pleasantly in section nineteen, township twenty-one, range four, is to be found one of the leading citizens and prosperous agriculturists of Madison county. This gentleman has made Nebraska his home for many years, and during that time has been intimately identified with its development along commercial and social lines. J. A. Johnson was born in Smoland, Sweden, October, 1864, and was one of six children born to John and Christina Johnson, the former departing this life when our subject was a small boy. When our subject was six years of age, the little family left their native land and took passage on an emigrant ship bound for America which the mother had heard was a mecca for poor people, and where she confidently believed she could find a home and plenty for herself and children. They sailed from Gottenberg, touched Liverpool, and after a tedious voyage landed in New York safely, from which place they started immediately for the west, stopping off in Stark, Illinois, where they remained for nine years. In the spring of 1879 they started out to look for a new location, and hearing of the golden opportunities awaiting those who had the spirit and determination to succeed, came to Nebraska and begun the life of pioneers. Each member of the family secured employment in Madison county, and in 1886 our subject filed on a homestead in township Box Butte county, leaving the others in their old places. He built a sod house and remained in that locality for a number of years, finally purchasing a tract in Madison county which he has improved in the best possible shape and it is now one of the most productive farms in the county. He has seen his share of hard times, going through all the experiences of the early settlers in the way of losses of property, suffering from the dreadful storms, etc., but has kept steadily forging ahead, and has been well repaid for his efforts in the valuable property he now owns in this and other parts of Nebraska. Mr. Johnson was married June 24, 1901, to Mrs. Minnie Youngston, of Madison county, and they have a family of four children, Myrtle, Florence, Walter and Ralph. the father engaged in the wholesale and retail dry goods business, being a member of the firm of Wentz, Hartley and Company, later becoming a member of the firm of Taft, Griswold & Kellogg, dealers in wholesale dry goods. In 1872 he sold his interests in the city and moved to Lincoln, Nebraska, at that time a little city of about five thousand population. He organized and became president of the Lancaster county bank, and in 1879 disposed of his banking interests and moved to York county, buying a farm near Bradshaw. He lived there until March, 1882, then moved with his family to Custer county and took a homestead on section nine, township nineteen, range nineteen, his home until 1892. Then, returning to Lincoln, he engaged in general mercantile business and continued to conduct it until his death, March 31, 1900. He was survived by his wife and seven children. Mrs. Hartley died in 1901, and those of the children now living are: William D., married and living in New Mexico; Carrie E., wife of C. W. Green, of Marquette, Michigan; Anson B., whose name stands at the head of this sketch; Joseph A., of Columbus, Ohio; Ellis T., of Columbus; Edward C., of Spokane, Washington; Flora B., wife of Charles Martin of Duluth, Minnesota. In the spring of 1882, Mr. Hartley secured a homestead on the southeast quarter of section nine, in the town where his father had located, and this remained his home until the spring of 1902, when he came to Sargent and engaged in the real estate business, also dealing in insurance and loans. He began business in a primitive cracker box. He has forty acres in the tract of way, and according to his own report his first office desk was a dry goods box and his chair a land where he has erected his pleasant home, land where he has erected his pleasant home, which adjoins Sargent on the west. His is one of highly respected and having many friends. They are ready to give of their time and money to aid every cause for the general welfare and prosperity and the friends of progress along all lines. On March 6, 1884, in Lillian township, Custer county, Mr. Hartley was united in marriage with Margie F. Dupray, and they have seven daughters and one son living: Carrie, wife of W. L. Probert, of Custer county, has two children; Fred A., in business with his father in Sargent; Mabel and May, twins; Bessie, Eveline, Grace and Elma, at home. It is mete that considerable praise should be given those early pioneers who came here when wilderness was King, for it is by reason of the hardships they suffered and the battle they fought that we in our generation enjoy the peace and comfort and plenty which we accept as our due. Among the early settlers of Cedar county, the name of Julius Hirschman is well known. Mr. Hirschman was born on a farm in Wisconsin in 1859, and is the son of Frank C. and Tecla Hirschman, both parents being foreign born. They came to America in one of the slow sailing vessels in 1852, and came at once to Wisconsin, where they bought forty acres of land, a holding which would have made them people of distinction in their native country. The family remained in Wisconsin and the boy Julius secured his education in the schools of that state. Finally, they decided to join the migration to the new lands of the west. So in 1872, they started for Cedar county, Nebraska, with a team of horses and a prairie schooner, coming by the overland route. It took three weeks to make the trip, and they made good time even then. Upon their arrival, the father took up a homestead in section eight, township thirty, range three. For a short time, the whole family lived here in a small dugout. For a long time the family struggled against the misfortunes which afflicted all settlers equally. For the first four years, their crops were destroyed by grasshoppers, and they were also compelled many times to fight for hours against the fierce prairie fires in order to save their home. Even when crops were good and were finally harvested, the surplus had to be hauled either to Ponca or Yankton, the two nearest market points. In 1887, Mr. Hirschman was united in marriage to Miss Anna Lorang, and to this couple have come five children: Clarence, Chancy, Julius, Susie and Earl. Mr. Hirschman has certainly done his full share toward the development of the agricultural interests of the community where he has lived for so long. He has a well-improved farm and is a representative farmer and citizen. Elijah McKendry, retired farmer, son of Elijah and Susan (Kiggen) McKendry, was born in Beverly, Ohio, October 31, 1844, and was the ninth in a family of ten children. He has two brothers and one sister residing in Ohio, one sister in Iowa, and the others are deceased. The father died in the year 1883, and the mother in 1872; both passed away in the home state.